The top lot was a fancy vivid pink pear-shaped diamond of 9.14 carats, achieving the second highest price for a pink pear-shaped diamond sold at auction at $18,174,631, or $2,000,000 per carat. 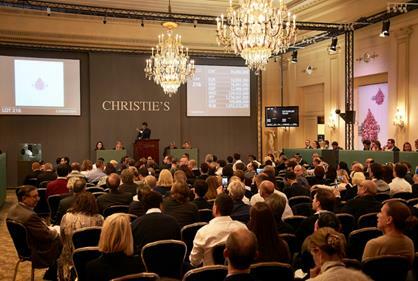 The revival of the Parisian 18th century Boehmer et Bassenge haute joaillerie house saw two spectacular lots offered, establishing a new record price for a pair of earrings sold at auction 17,567,500 Swiss francs, and 8,327,500 Swiss francs for a D color diamond necklace, entitled Le Jardin d’Isabelle. The third piece made by the house – another pair of earrings with the main D-color flawless diamonds weighing 11 carats each - will be sold in Hong Kong on November 29.